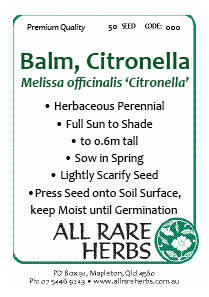 Citronella Balm, Melissa officinalis “Citronella”, has double the oil content of other Balms and is the most fragrant variety available. Dried leaves make a refreshing tea that both stimulates the heart yet calm the nerves. Freshly chopped leaves are a surprising addition to salads. soup and stews. Crushed leaves are redolent with the scent of freshly squeezed lemon. An herbaceous perennial of upright and compact form to 30cm. Suitable for container culture. Mildew resistant. Be the first to review “Balm, Citronella seed” Click here to cancel reply.